Today we travel to the Rocky Mountains of North America to explore a great big home built for entertaining large groups of friends and family. It was built for a retired woman who spent years living on the family farm, but wanted a place a little closer to town to spend time with family. 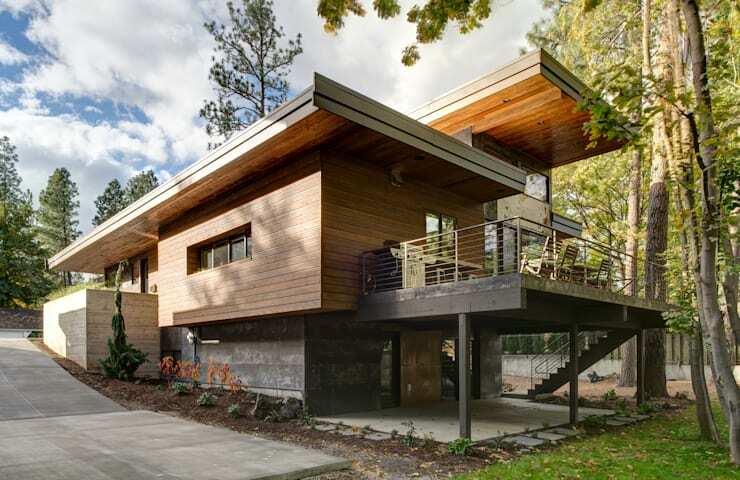 The home has a boundless, natural quality and the proportions are huge. It covers 222 metres of floor space and has multiple entertaining areas. This is definitely a home to drool over if you love big sociable rural homes! So get ready for a big American tour and come with us to check it out. 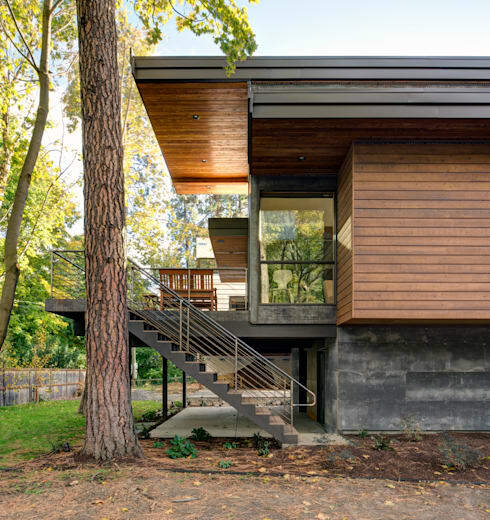 This one comes to us courtesy of architects Uptick Studios. Every sociable home for the extended family needs a good outdoor area. 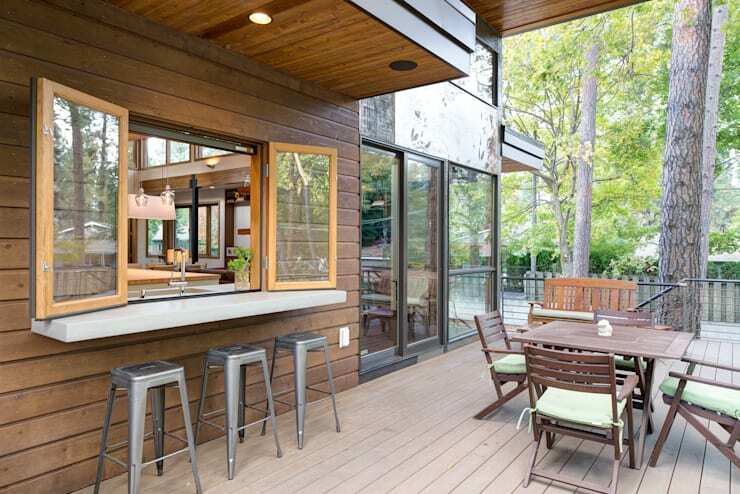 Here we can see how beautifully a deck can be integrated into the kitchen area as well. We have a good sized bar and an additional outdoor dining set. This is perhaps the most sedate view of the home, so let's keep going! 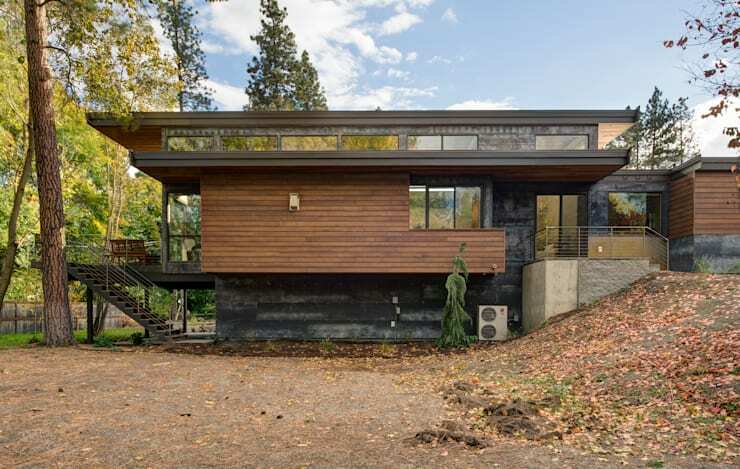 The home has multiple levels designed to fit into the natural slope of the land. 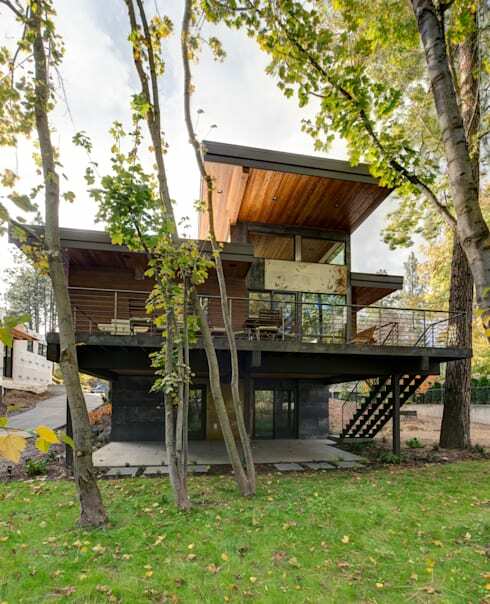 This gives the lower levels a comfy, sunken in ambience and the upper levels a close connection with the surrounding foliage. The basement floor here is used as a playroom and sleeping area for young guests. Also, note the high-set panel windows on the upper floor. These play a big part in the interior design. 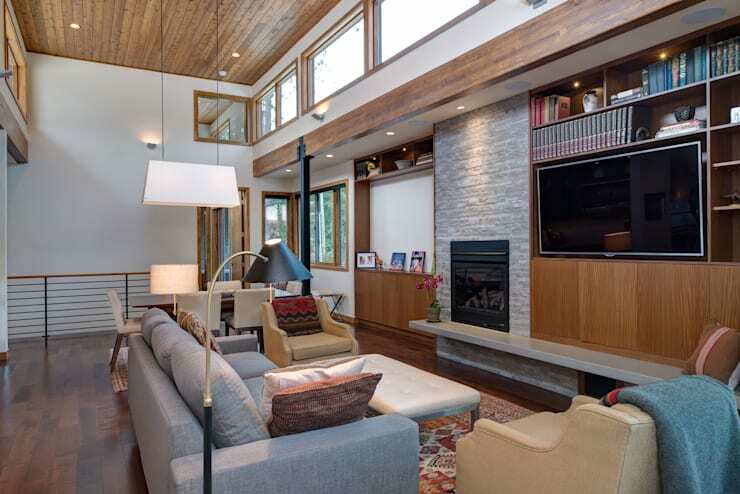 The visual weight of such a big home is broken up by designing the home as several separate volumes with different outlooks and a visually light supporting beams. The roof of the upper level draws the eye and the side walls are smaller, made from glass or hidden from view. This accentuates the light-weight, almost floating feel of the design. It also makes the facade feel at home amongst the treetops. 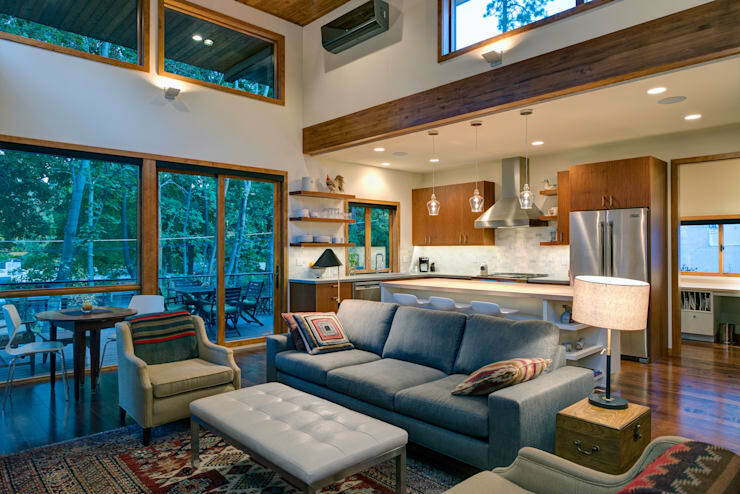 The big open plan living room has been furnished with groups of furniture clustered into smaller areas. This gives the big home an intimate feel that's perfect for hosting larger gatherings. There are also lots of seating options which is sure to be a hit with younger guests. Note how the wooden accents have been used to tie the design together. Now, let's see how smart design can make even the smallest home feel luxurious. Come check out 11 truly tiny homes that prove size doesn't matter. The breakfast style bar makes this a great home for socialising with family members while working in the kitchen. The chunky wooden bench gives the home an earthy feel that is important in a family style home. 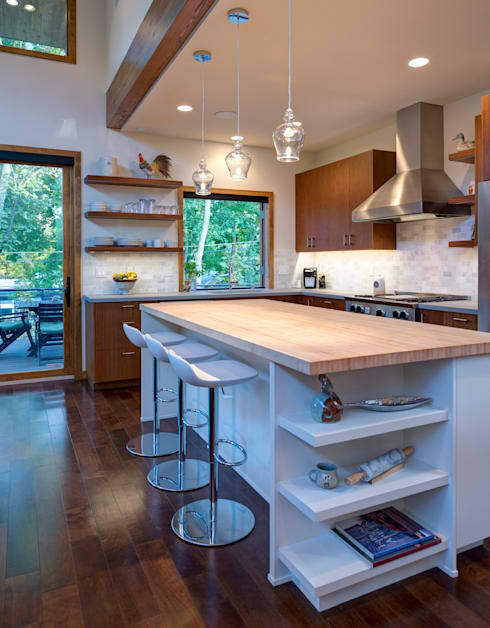 Of course, there is lots of storage space and bench space for cooking up a feast too. The owner asked for lots of wall space to hang pictures of her family. Here we can see just a hint of that in the side cabinet area near the dining room. Here we also get a good view of the upper level panel windows. They allow the greenery outside to become a real living part of the interior design. 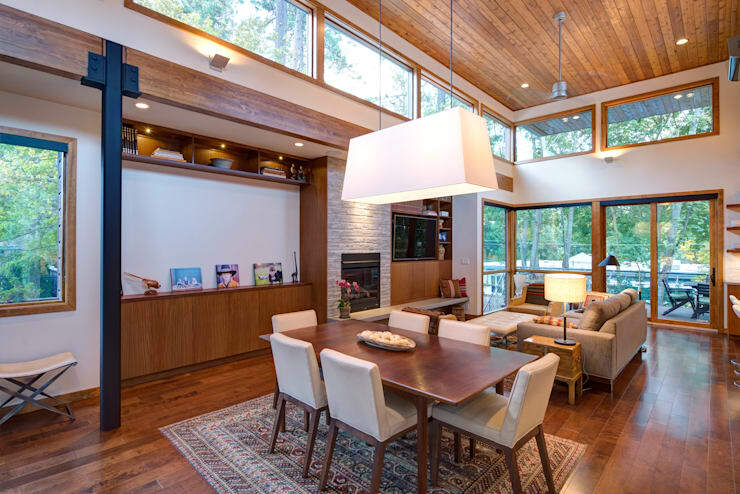 Also, note how the chunky long hanging dining light has been used to create a zone around this area. 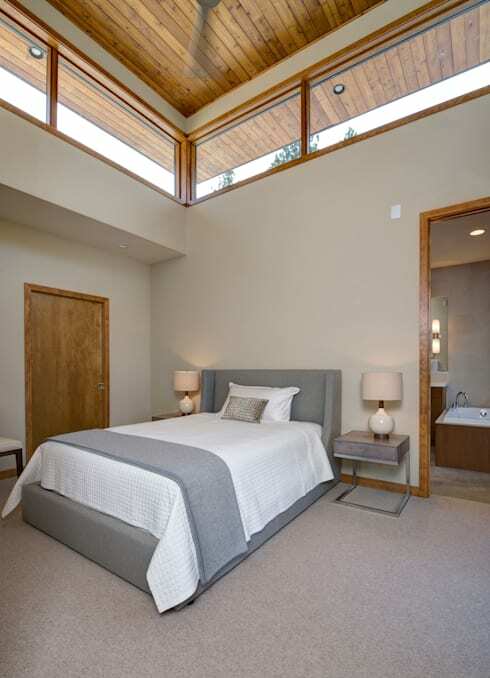 The high-set panel windows really show their value in the bedrooms. 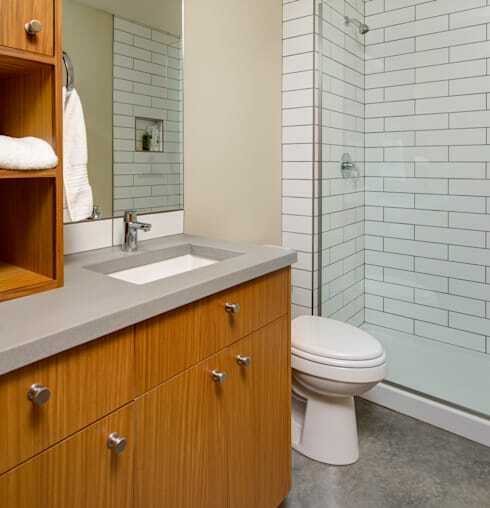 This one has unparalleled privacy and a cosy, soothing feel. The earthy colour scheme used throughout the home is well adapted to the kitchen, living room and sleeping areas. This is the perfect home for hosting big gatherings. Which aspect of this home is your favourite?